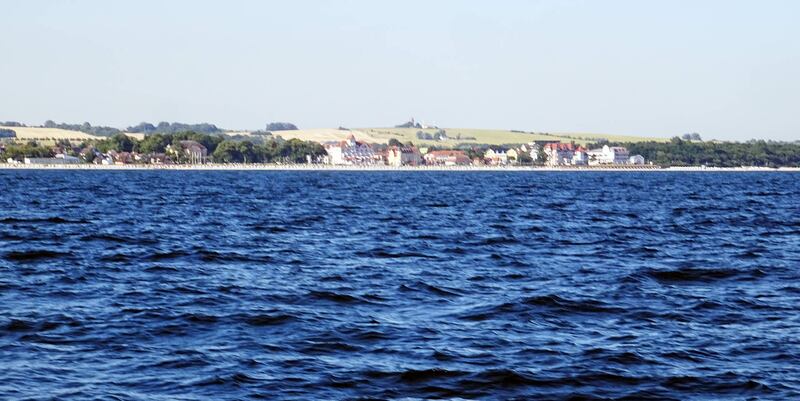 Kuehlungsborn is one of the classy German Baltic seaside resorts, most known for the spotless beach. For more than a Century Germans have spent their holidays here and even during the Cold War times tourism flourished. Not so long ago the municipality decided to build a modern harbor for pleasure craft and yachts as well as for the (last remaining) local fishermen. The outcome is a very beautiful place with its own style, the construction of this marina was finished in the year 2005. 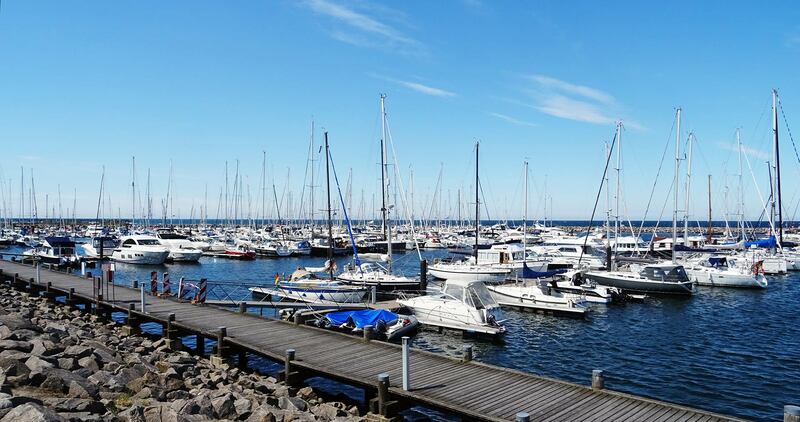 Kuehlungsborn is situated approximately 15 miles west of Rostock/Warnemuende (read the marina review here) and is the last reasonable marina for sailors going further west rounding the Island of Fehmarn. There are indeed a lot of marinas more west but southerly as well so that, in order to pass Fehmarn, Kuehlungsborn is the last port to stay to the southern shores of the Baltic Sea whereas Gedser (almost 20 miles straight north from here) is the last port on the northern shore of the Baltic Sea (by the way, Gedser has a marina and a fishing harbor for yachts). Negotiating Kuehlungsborn is a no-brainer both at daylight and during the night. Approaching the entrance should be done with an easterly tendency as the entry of the breakwater opens to the East (prevailing winds here are Westerlies). There are some bigger stones directly south of the entrance, so steering from the East is even more recommended. If strong winds are blowing seaward one might be aware that the depth inside the marina can drop significantly – depth is otherwise 3 to 3.5 metres. 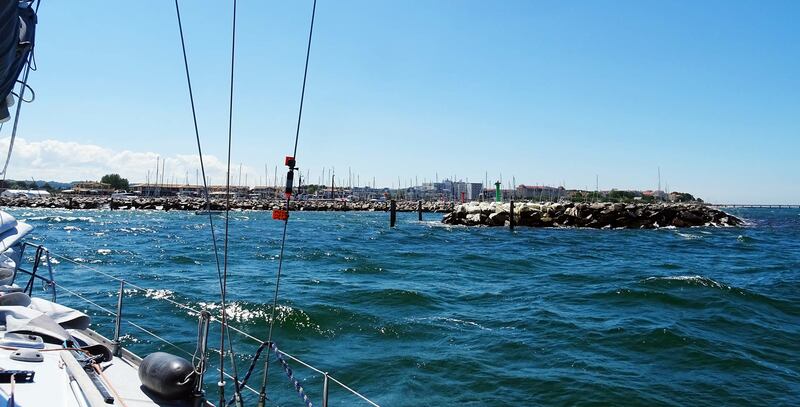 Leeward blowing strong winds may be responsible for bumpy landing manoeuvres but the berths and spaces between the jetties are more than sufficient. Kuehlungsborn marina is a big one. The harbor offers some 400 berths, most of them for guests although a steadily growing fleet of permanent residents is having it´s boats here. The marina is open all year long – that means that also in winter time the harbor can act as refuge in foul weather situations, most of the amenities of course are only available during the season which starts in April and finishes by the end of October. Notice the wide passageways between the jetties. Good for manoeuvres. The berths are German-style – that mans you will land your yacht bow first between large poles (nicely coated with a GRP-gentle rubber layer) or at finger-jetties. Free berths are marked by a small green sign at the end of the berth down at the jetty – it´s a bit tricky because you cannot easily spot them and sometimes you are halfway in the berth upon realizing that the berth is occupied. Anyway, Kuehlungsborn offers the booking of a berth in advance online. If you are not sure where to go or you don´t want to negotiate inside the marina in too strong winds, land you yacht alongside the long jetty to starboard side upon entry. It´s in fact the longest way to the harbormaster but the fastest and safest way to get the boat safely landed. You know that I do have my problems with German harbors: High demurrage, no WiFi included, bathrooms with coins. It´s a mess sometimes and I wonder why technological progress didn´t seem to affect the marina business here in my country anyway. But, there are exceptions and Kuehlungsborn is one of them: Let´s talk prices and included services. Demurrage for our 40 feet yacht was 27 Euros flat. That´s not a bargain, but at least the WiFi is included (and connection was brilliant, streaming rate excellent! ), as well as electric shore power and fresh water. There was NO extra charge for taking a shower and … wait for it, the bathroom facilities were absolutely exemplary! As well as the friendly staff working here. My sailing mate was blown away by the great efforts that went into the weather forecast: He was so delighted by the hand made individual forecast that he was talking for about half an hour about it. Nice. Not so good was an extra charge for every other person staying aboard: So, if you arrive with a 40 feet yacht and a 4 person crew, that´s a 2.50 Euros surcharge per person and day. Wow. Anyway, I hoped that the management would re-invest some of the money into facilities and yes, they did. Looking at the bathroom facilities I must say that Kuehlungsborn marina is one of the best harbors in this respect I have ever visited! Not just the fact that there are more than enough toilets and shower cabins to deal with the morning stampede of the sailors, it´s also very nicely done in terms of featured fittings, materials and colors. In this respect, it is really a great place to have your boat moored – imagining first landfall here after some days out on the seas, you crew will love it because it almost feels like being a guest in a day spa. Well, I am a bit exaggerating, but we´ve all seen so bad places when it comes to bathrooms, that this one really sticks out very, very positively. The next big supermarket is just 800 metres walking distance away so replenishing your provisions won´t be a problem. 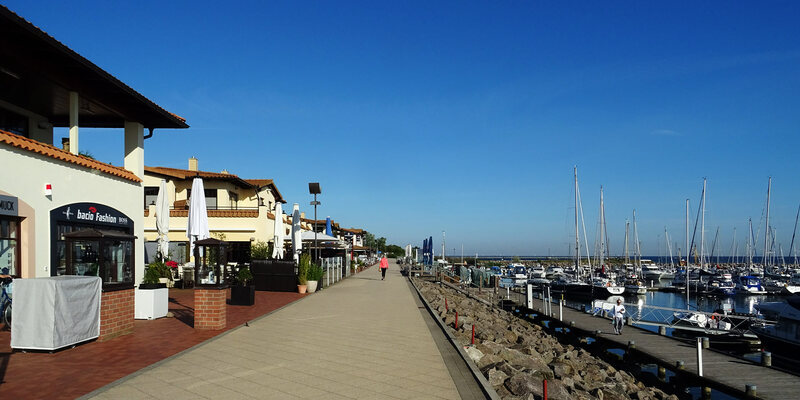 Anyway, the nicely done waterfront of the marina offers manifold delights: There´s a fine Steak House, a decent Italian restaurant, a bakery, a handful of Bars and Cafés and a “Cult Curry Wurst” snack point. At nightfall some of these offering live music and are not only attractive to sailors and crews but also to local residents and tourists from the village. Perfect beach. But well crowded as well. Directly adjoining the marina is a huuuuuge perfect white beach (renting a beach chair is 9 Euros a day) and of course the village of Kuehlungsborn which is a perfectly equipped seaside resort with trestaurants and bars of all kind and tastes offering food and drinks for each purse – just a 10 minute walk from your boat. A different world, but a happy one. I loved staying that one night here in Kuehlungsborn. I was absolutely stunned by the high quality of all services offered and the high standard of everything here. But this all comes with a price tag which is – in comparison to Gedser “just” vis-à-vis at the northern shores of the Baltic Sea – pretty high. Nevertheless, you get some bang for your money, that´s for sure.